I have been secretly working on my mud room for a few weeks now and this week is the big reveal. I am going to start with a few project posts then I will show you the entire room. One of the first projects I tackled was making a barn wood frame. You see I had this plain old builder grade mirror. You know the one with those awful clips that hold it on the wall? Well it was time to say bye to those clips and hello to gorgeous farmhouse style. If you want to be inspired by even more rustic wood projects, be sure to scroll to the end of this post. These are actually tobacco sticks from an old barn on our property. You can use any old barn wood or worn lumber that you have on hand. Cut to the size so they will cover just the edges of your mirror. 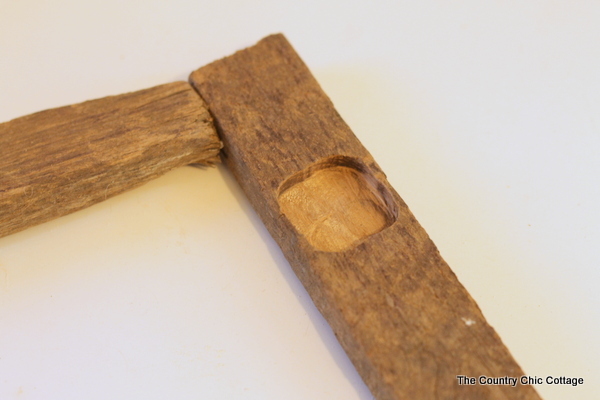 Then drill very small holes in the ends for nails. 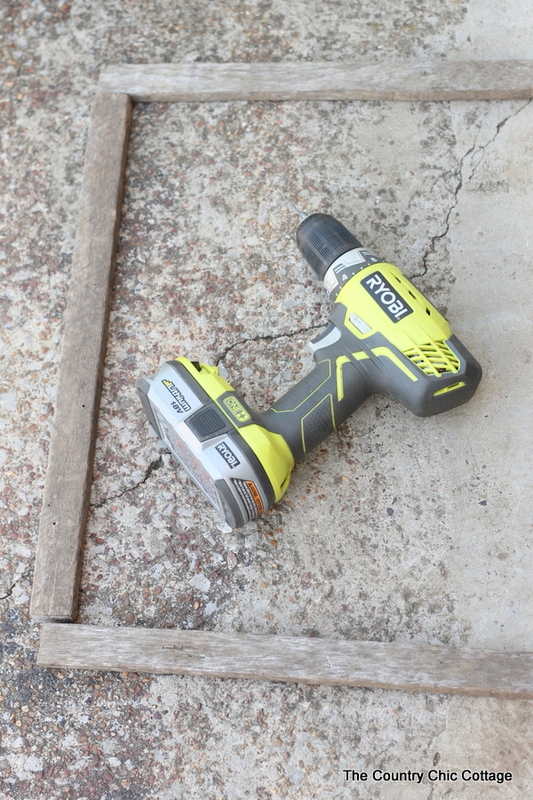 Drilling is very important so you do not bust the wood when nailing. Each corner gets some wood glue and two nails. Double check that you are square with each corner. You can see the two nails in the end in the picture below. They are just finishing nails. I was actually not worried about being able to see the nail heads. This is supposed to be rustic farmhouse style after all. Next it is time for power tools! Mark where each of those plastic clips sit and start in with a router. Route out an area for each one to sit. I would route then double check on the mirror, route some more, etc until the fit was right. Then I just put the entire thing up with a couple of finishing nails right into the front of the frame and into my drywall on the edge of the mirror. I teased y’all above with a statement about my mud room makeover. See below for a quick sneak peek….you don’t want to miss it! Until then, maybe make a barn wood frame for a plain mirror in your own home. I also promised you even more rustic wood projects. 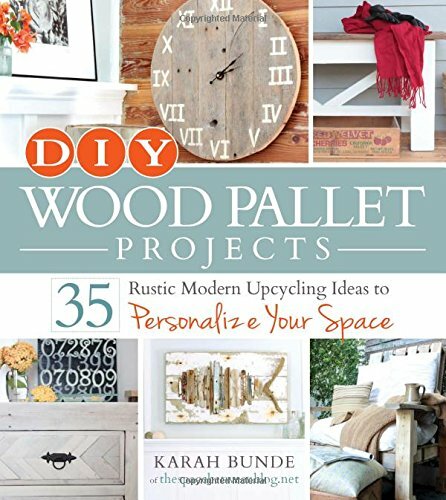 My friend Karah Bunde has written a book titled DIY Wood Pallet projects. 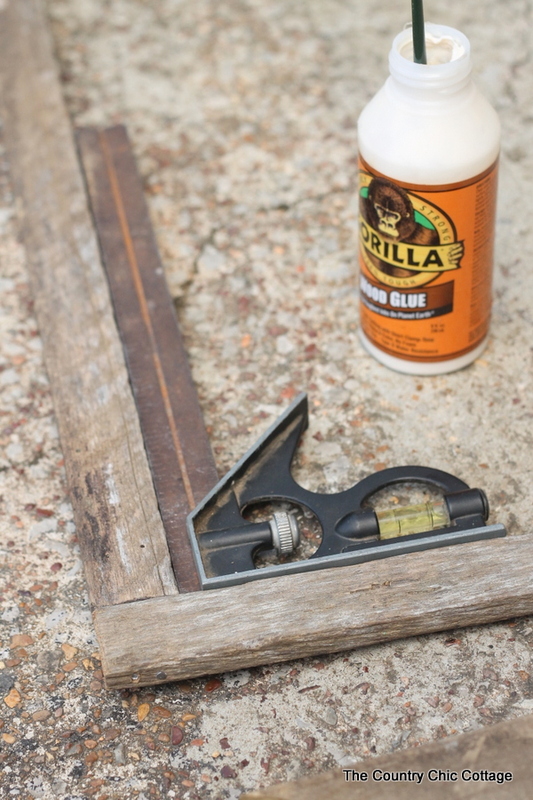 Want to learn more methods for making a rustic wood frame? She has it! Adding pallet wood furniture to your home? Yep she has that too! The best part I found with the book was that she has safety tips on how to choose pallets for your home. This is vital information y’all as some of them can have tons of chemicals. Grab her book DIY Wood Pallet Projects: 35 Rustic Modern Upcycling Ideas to Personalize Your Space over at Amazon today. I am telling y’all…you won’t be disappointed! 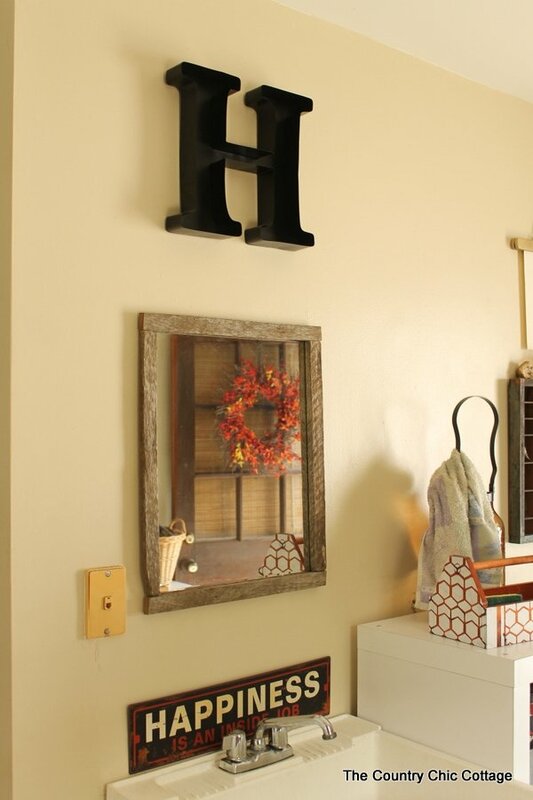 next post: Make a Gold Hanger for Pictures in Minutes! I LOVE how your frames came out. Such a great rustic addition to the new mudroom. And thank you so much for sharing the book!! on it. We’d have to use pallet wood which we have much of, not as thick as your wood. Have to use what we have. Is it getting to be Fall where you live? I forget where you live, sorry. We live west of Grand Junction, CO. We’ve been having some nice Fallish weather. I had really had it with the heat. So nice to hang laundry out without getting soaking wet with sweat. Back of our house faces west so in afternoon it really gets super hot in summer.